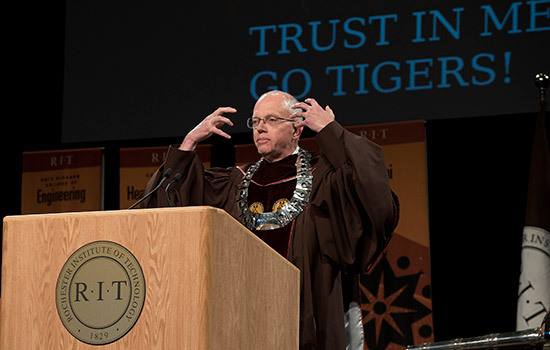 RIT President David Munson signs ”Go Tigers!” at the end of his inauguration speech. Thank you, Christine. Thank you, Trustees Holliday, Harris and Truesdale. Thank you, Provost Haefner. And thank you, President Hanlon. It is with great excitement and anticipation, and also humility, that I stand before you today as the 10th president of Rochester Institute of Technology. Let me begin by thanking the Board of Trustees for putting your faith in me. And to the broader RIT family — students, faculty, staff, alumni and friends: Nancy and I thank you, too, for your gracious welcome to campus and to the Rochester community. RIT has been rapidly ascending for many years under forward-looking leadership and is now one of the top few universities in the nation working at the intersection of technology, the arts and design. Let’s please acknowledge RIT president emeriti: Richard Rose, Al Simone, and Bill Destler. Gentlemen: You have left an incredible legacy. I am grateful for the ideals you espoused, the momentum you generated, and the leadership you displayed in transforming RIT into a global university. I received my education from the University of Delaware and Princeton University, where I benefitted from accomplished teachers and researchers. Most important of all was Bede Liu, my Ph.D. adviser, who is with us today. Thanks, Bede! Phenomenal faculty and staff colleagues have been with me every step of the way in my career. And I’ve also been fortunate to work with brilliant students. I am indebted to both the University of Illinois and the University of Michigan for fostering my professional growth and many lifelong friendships. President Hanlon: Thank you for your kind words. I am much obliged for your support during our time together at Michigan, and I am honored by your presence today. On behalf of RIT, we do, indeed, thank Dartmouth for giving up the School for American Crafts so that we, at RIT, could watch it bloom for nearly 70 years on our campus. Phil, I do have to ask: Have you got anything else for us? And finally, I’d like to thank my family: my mother, Joyce, who is here today. Uncle Art and Aunt Jean, brother Gary, and Beth, brother Mark, and Nandi, sister Wendy, and Michael, brother Jamie, my amazing wife and partner, Nancy, her sister Linda, and Duane, our son Ryan, and Josh, son Mark, and Megan and Sophie, and son Jamie, and Paige. I am blessed to have this incredibly supportive family. Christopher Edwards, a renowned 3D layout and animation artist at Disney, who is now founder and CEO of The Third Floor, billed as the world’s largest international previsualization company. Renato Libric, named Entrepreneur Magazine’s No. 1 entrepreneur to be followed in 2017. He is widely recognized as a global serial entrepreneur, investor and speaker on topics such as new technologies, social entrepreneurship, education, sustainability and transportation. Patricia Moore, recognized by ID Magazine as one of the “40 Most Socially Conscious Designers” in the world. She is an internationally renowned industrial designer, gerontologist and author. William Snyder, a four-time Pulitzer Prize-winning photographer and chair of our photojournalism program in RIT’s School of Photographic Arts and Sciences. These esteemed innovators all have made significant contributions to our world. Let’s offer a round of applause to thank them for sharing their insights on the creative process. Creativity and innovation flourishes at modern-day RIT, but let’s begin with some important history. RIT was born of an unlikely institutional marriage of an influential cultural association, the Rochester Athenaeum, founded in 1829, and a technical training school, the Mechanics Institute, founded in 1885. The Athenaeum was essentially a learned society. It cultivated and promoted literature, science and the arts by offering public lectures and debates, and establishing a library. Lectures were held in a huge hall and included speakers such as Charles Dickens, Ralph Waldo Emerson, Oliver Wendell Holmes, and Frederick Douglass. The Mechanics Institute, similar to others around the nation and the world, was a school established to provide technical training for workers in industry. Applied fine arts were soon added to the Mechanics Institute’s curriculum and then, in 1891, the Athenaeum and Mechanics Institute merged to become what would eventually become RIT. English was added to the curriculum in 1899, as the board of directors felt that technical professional instruction alone did not constitute a complete education. Board members noted: “The manual course which should be strong is weak inasmuch as it contains too much manual and too little mental work.” Despite this enlightenment, the school that emerged was initially mostly a trade school, focused on teaching very practical skills that were needed in local industry. Fast forwarding to today, the world has changed mightily and so have we! The path to major success in business and industry now relies more than ever on creativity and innovation. This is a product of the Digital Age, where change is rapid, information is instantly available, and nations and economies are globally interconnected. We live in one world and, across the planet, we share both problems and opportunities. Issues that come to mind are poverty, nuclear nonproliferation, global warming, sufficient clean water, renewable energy, and affordable healthcare. I note that, although technology can help in solving these problems, much of the solution, maybe even most of the solution, will not be technical. In many cases, we already have the technology, or at least much of what we need. But we may not have the political and social answers, or the leadership and willpower. Of course, new technology often brings new challenges. Think about the future, when it will be possible to have your genes edited to make a better you. In what cases will this be ethical? What might be the societal risks? How far should we go? With progress in artificial intelligence and robotics, how long will it be before we humans are routinely interacting with machines in very complex tasks? Will these machines be partners? Will they be superior to us? Can they be programmed to have a conscience? How much should we let these machines do? Will we humans always be in control? What kind of education should our students receive in order to help answer some of these questions and thereby contribute to guiding the future of society? Clearly, we need strengths in science and technology, but we must be more than a modern-day Mechanics Institute. In my opinion, the world needs us to be more like the Athenaeum. As our predecessors rightly determined in the 19th century, an education must go beyond the purely practical. An education that is too practical can be self-limiting. According to a World Economic Forum report released in January 2016, by year 2020 about a third of employment skills that were considered important in 2016’s workforce will have changed. And I note that the Forum’s report does not call for enhanced skills in specialized areas such as computer programing or design of automotive engines. In fact, it does not focus on most topics that we currently teach in STEM disciplines at universities throughout the world. Perhaps that’s OK, because, given the fast-changing nature of technology, such material often has an expiration date. Rather, the Forum’s report says the top three skills for 2020 are 1) Complex problem solving, 2) Critical thinking, and 3) Creativity. The Forum also highlights collaboration, emotional intelligence, judgment, service orientation, and cognitive flexibility. And these proficiencies do not have expiration dates. So how do we prepare Generations X, Y, and Z for jobs that don’t yet exist and to tackle challenges that have yet to be identified? Creativity is the skill that is climbing up the chart the fastest. With the rush of new technologies, and new products and services, workers must become more creative if they want to be in the driver’s seat. The Forum recommends — and RIT endorses — that we must continue to rethink our educational systems, so that we are building a broad, multidisciplinary skill set where creativity is exercised at every turn. I am optimistic that we already are far down the right path. After all, what other university hosts a creativity festival that draws 30,000 attendees annually? And who else has a college like our National Technical Institute for the Deaf, offering cutting-edge arts experiences alongside STEM degree programs, serving more than 1200 students who are deaf or hard-of-hearing? And think about some of RIT’s first-of-a-kind academic programs and others that cross disciplinary boundaries. We’re accustomed to trying new things – it’s part of our DNA. In the future, we will be placing increased emphasis on research and discovery, scholarly work and artistic expression. But as we become more research oriented, our students will be at the forefront. We will work together in our aspiration for RIT to become the most student-centered research university in the nation, while we train the future leaders of society. Along with preparation for a career, our students will develop a broad skill set, an understanding of the larger world, and a passion for making a difference. We can take our lead from President Woodrow Wilson, who in 1913 stated, "You are not here merely to make a living. You are here in order to enable the world to live more amply​, with greater vision, with a finer spirit of hope and achievement. You are here to enrich the world …"
Here is another reason for optimism: In a recent survey titled “Making Way for Innovation” conducted by the Chronicle of Higher Education, university leaders noted they are investing in new technologies and are committed to guiding their institutions through transformative times. And what is the bright spot among the survey’s key findings that should energize all of us? Students are now seen as the prime drivers of innovation! This is in contrast with past surveys, where the leading agents of change on campus had been university presidents, politicians, faculty and business leaders … maybe we should follow our students! Of course, creativity and innovation are best used for noble purposes. I recently asked an RIT trustee why she joined the Board of Trustees. This trustee, who is not an alumna of the university said, “I am so passionate about RIT because of the essential goodness of the people and the place.” That really struck a chord with me. Goodness is: Our National Technical Institute for the Deaf that not only provides educational programs, but also collaborates with researchers throughout the campus in the development of assistive and accessibility technologies for people with physical challenges. Goodness is: Serving students from lower socio-economic status and watching them thrive as they break through that generational poverty cycle and lift their families. Goodness is: A group of RIT students producing a social media campaign to help combat extremism and fight terrorism around the globe. Goodness is: Harnessing light via photonics devices to extend the lives of cancer survivors, to research how the human brain develops, and to determine if we, on Earth, are alone in the universe. Goodness is: Tackling complex sustainability issues — ranging from improved energy production and savings, to developing “smart cities,” to reducing food waste — in an effort help a planet whose population will grow from 7.6 billion to nearly 10 billion by 2050. Goodness is: Establishing campuses overseas to create new educational opportunities for our students and to foster mutual understanding and cooperation among different nations and cultures. Goodness is: Embracing diversity, equity and inclusion. The RIT of the future will be powered by many dimensions of diversity, where the talents of all are valued and employed. And that, too, is goodness. ouldn’t Susan B. Anthony and Frederick Douglass, long-time Rochestarians, be proud of where we are headed? Let me conclude my remarks by emphasizing that our university is truly unique in higher education, with its core in technology, the arts, and design, and other important disciplines radiating out from that core. Maintaining our steep upward trajectory will be made possible by further leveraging this model, and working across disciplines to help solve the most pressing issues of our time, and by offering an education that is future-proof. I am honored to be part of the RIT family, at the helm of this great, global university that is changing the world. Let’s get busy creating and innovating. Let’s share our goodness with the world! Thank you for this opportunity. And thank you for putting your trust in me.